In keeping with its mission, Contemplative Network's board of directors consists of contemplatives, with the majority from various Christian denominations, plus a minority from other faith beliefs. Contemplative Network is self-governing and independent of any other organization. However, it has contact with representatives of various contemplative organizations, including The World Community for Christian Meditation (WCCM) and Contemplative Outreach Ltd. (COL). This assures accurate and respectful teaching of the various contemplative traditions. Additional collaboration, both interfaith and scientific, comes from common board members with the Institute for Spirituality and Health (ISH) in the Texas Medical Center (TMC). The ISH is the oldest such organization in the US, and the TMC the largest medical center in the world by four times. All board and organization members are volunteers, receiving no salary or other compensation, with none having lifetime appointments. The following are the current board members, officers, and staff with links to some of their resumés. Book Review by R. J. Hesse, Ph.D.
We may think of prayer as thoughts or feelings expressed in words. But this is only one expression. In the Christian tradition Contemplative Prayer is considered to be the pure gift of God. It is the opening of mind and heart — our whole being — to God, the Ultimate Mystery, beyond thoughts, words, and emotions. Through grace we open our awareness to God whom we know by faith is within us, closer than breathing, closer than thinking, closer than choosing — closer than consciousness itself. Centering Prayer is a method designed to facilitate the development of Contemplative Prayer by preparing our faculties to receive this gift. It is an attempt to present the teaching of earlier times in an updated form. Centering Prayer is not meant to replace other kinds of prayer; rather, it casts a new light and depth of meaning on them. It is at the same time a relationship with God and a discipline to foster that relationship. This method of prayer is a movement beyond conversation with Christ to communion with Him. For more information, please join us at our next Resource Meeting or Introductory Workshop, and visit our Introduction to Centering Prayer Workshop page. Need to download Adobe Reader? Click on the graphic below. If you have any questions about our programs, you may contact Carole Pentony or call 713-729-6019. Your loving donations are greatly appreciated since they support the teaching of Centering Prayer in the various ministries and research into the health benefits of the prayer practice. All of our staff are volunteers and draw no salaries. This is to confirm that your donations are fully tax-deductable, since Contemplative Network is a 501(c)(3) tax-exempt organization under the Internal Revenue Code. The IRS tax I.D. number for Contemplative Network is 27-1738129 per the letter from the Department of the Treasury dated 6 April 2010. We are pleased to offer reviews of the following DVDs. These thoughts emerging out of the silence and solitude of the eremitical life of a hermit were not specifically written as reviews, but are part of the personal correspondence of a 77-year-old Catholic priest-hermit friend of Contemplative Network. Our hermit friend began his contemplative God-search 57 years ago with the Trappists at the Abbey of Gethsemani, where Thomas Merton was his novice master. After six years and his simple vows completed at the Abbey, he sought more solitude living as a Camaldolese hermit, where he was ordained and then independently with a Bishop under the Code of Canon Law #603. In sharing these thoughts on contemplation via his personal letter, he was inspired by Thomas Merton and his echo, James Finley. He wishes to remain anonymous in order to preserve his God-given eremitical calling to solitude and the hermit's urgent need to open his awareness to the intimate love affair our abiding God is initiating within our innermost being from moment to moment. Our hermit friend was drawn to the James Finley DVD because he considers him an authentic experiential echo of Merton, and the DVD to be a blessing for the human family. by James Finley, et al. Our local Contemplative activities over the years have included many visits by leaders of the Christian contemplative communities, which were attended by thousands. Ecumenical outreach has included Catholics, Episcopalians, Presbyterians, Methodists, Baptists, Orthodox, Quakers, and Disciples of Christ. Charitable work has included the Prison-Homeless Outreach, women’s shelters, prisons, and hospitals. The following is a brief history of significant milestones. 1986 – We were one of the first Contemplative Outreach, Ltd. (COL) chapters, having been formed by Fred Eckart shortly after the incorporation of the national organization in 1986 under the spiritual leadership of Trappist Monk, Abbot Thomas Keating. Fred began working with the national organizers in 1985 and continued to serve at the national level. 1989 – Fred was appointed founding Coordinator in 1989. His many contributions at the international level included starting the prison ministry. 2004 – At a visioning day meeting, in preparation for Fred’s resignation due to health concerns following 14 years as Coordinator, Drs. Bob Hesse and Kim Kehoe were appointed the new Co-Coordinators. 2008 – Christian contemplative organizations encouraged the formation of a tax-free entity to support ongoing and planned ministries, which had precedence set by several other such organizations in U.S.
2011 – Contemplative Network Inc. was formed and granted 501(c)(3) nonprofit status. Co-founded by Drs. Bob Hesse and Kim Kehoe, Contemplative Network (CN) has three ongoing ministries in keeping with its mission: teaching Centering Prayer and related prayer, interfaith collaboration, and scientific research. In an open letter to the Jewish and Christian Communities, two men of God, Rabbi Zalman Schachter-Shalomi and Fr. Thomas Keating, wrote of their ecumenical efforts to bring contemplative prayer into the ordinary lives of people of many faith beliefs. They wrote that every faith has some form of contemplative practice, but it is especially important that the common roots of the Jewish and Christian traditions be united in prayer to contribute to healing the divisiveness so common in today’s world. In silence, there is no doctrinal reflection, so we are open to God speaking to us. To encourage interfaith collaboration in contemplative prayer, they co-authored the Judeo-Christian “Oneness Prayer Guidelines” to encourage the two communities (Judaism and Christianity) to learn and pray together, and to open themselves up to the gift of a deeper contemplative prayer practice. Please click here to view both Prayer Guidelines and Judeo-Christian contemplative video. Prayer Guidelines from an open letter to the Jewish and Christian Communities, two men of God, Rabbi Zalman Schachter-Shalomi and Fr. Thomas Keating, wrote of their ecumenical efforts to bring contemplative prayer into the ordinary lives of people of many faith beliefs. I. SACRED WORD - Choose a sacred word as the symbol of your intention to consent to a higher power that exists both within and without. A. The sacred word is chosen during a brief period of reflection and may arise spontaneously to your awareness, unique to your personal needs. 1. Examples: One, Oneness, Echad, Abba, Adonai, God, Hineini, Father, YHWH (unpronounceable “tetragrammaton”), etc. 2. Other possibilities: Love, Shalom, Peace, Ahavah, Silence, Ayin, Stillness, Trust, etc. B. Instead of a sacred word noticing one's breath may be more suitable for some persons. The same guidelines apply to these symbols as to the sacred word. C. The literal meaning of the word is not important. It is a symbol of your intention and consent to the omnipresent Oneness. D. We may try different words before arriving at our choice. However the word should not be changed during a period of Oneness Prayer because that would be a start to thinking again. II. PHYSICAL BEING – Remove shoes and loosen constricting clothing. Sitting comfortably and with eyes closed, settle briefly, and silently introduce the sacred word. A. "Sitting comfortably” means relatively comfortably so as not to encourage sleep during the time of prayer. B. Whatever sitting position we choose, we keep the back straight during the prayer. C. We close our eyes as a symbol of letting go of what is going on around and within us. D. We introduce the sacred word inwardly as gently as laying a feather on piece of absorbent cotton. E. Should we fall asleep upon awakening we continue the prayer. III. THOUGHTS & MEANING – When you become aware of being engaged with your thoughts, return ever so gently to the sacred word. A. “Thoughts” is an umbrella term for every perception, including body sensations, sense perceptions, feelings, images, memories, plans, reflections, concepts, commentaries, and spiritual experiences. B. Thoughts are an inevitable, integral, and normal part of Oneness Prayer. C. By “returning ever so gently to the sacred word” a minimum of effort is indicated. This is the only activity we initiate during the time of Oneness Prayer. D. During the course of Oneness Prayer, the sacred word may become vague or disappear. IV. SILENT RETURN – At the end of the payer period, remain in silence with eyes closed for a couple of minutes. A. The additional 2 minutes enables us to bring the atmosphere of silence into everyday life. B. If this prayer is done in a group, the leader may slowly recite a prayer such as: “be still and know that I am God” [Psalm 46:11], while the others listen. Hospital Ministry: Doctors, nurses, and patients in the M.D. Anderson "Place of Wellness;"
Judeo-Christian Ministry: Supporting Judeo-Christian contemplative prayer. Please visit the links below to our Ministry pages. Prayer Groups may seem the antithesis of Contemplative Prayer; however, motivation can be a problem for beginners, intermediate, and even advanced followers of contemplative prayer. Groups are a great place to gather to refresh your understanding of this powerful prayer form, to study methods and history, as well as to encourage others on the journey. Click here for a list of upcoming Taize Prayer events. Prayer in the style of Taizé (referred to herein as “Taizé common prayer”) is often known for its simple, beautiful, meditative songs that open the mind and heart to the gates of trust in God. These songs made of short verses express basic Biblical realities of faith that are quickly grasped by the mind, and with their repetition, these realities permeate one's whole being. At its essence, meditative singing becomes a way of listening to God's word and learning to experience an inner life in the silence of our hearts. Silence as a unique moment to meet God is an essential element to Taizé common prayer. Among the many kinds of prayer present during a Taizé common prayer (Pslams, scripture, intercessory prayers, songs of praise and thanksgiving), there is also a long period of silence in the middle. During this silence, participants rest in the trust of God, surrendering worries, fears and leaving to God what is beyond reach and capacity. At its root, the Taizé common prayer seeks to calm and quiet, to open hearts in silence to be filled with the unconditional love of the Spirit of God. For those familiar with Taizé common prayer, but unfamiliar with Centering Prayer practices, they will discover that they grow from the same root of seeking to surrender the mind and heart to the intimate presence of God. They share the same spirit of ancient monastic traditions to open space to let the Word of God reverberate in all its dimensions. Those who have tasted of this open space during the silent period of a Taizé common prayer service may find themselves well disposed to explore related contemplative practices such as Lectio Divina and Centering Prayer. Those familiar with Lectio Divina and Centering Prayer, but unfamiliar with Taizé common prayer, will discover rich ground in how Taizé common prayer supports one's disposition to the inner work of the Spirit of God. Some may draw similarities between these meditative songs and what Fr. Thomas Keating referrs to as the “Active Prayer Sentence” (see Appendix 2 of Open Mind, Open Heart), where he recommends choosing a short aspiration drawn from scripture for daily use. The regular repetition of such short scripture verses work into the heart over time, providing a greater inner disposition to the Spirit of God in daily life. The brevity of most Taizé common prayer songs lend themselves well to being assimilated into such contemplative practices involving simple repetition. Taizé common prayer developed out of the ecumenical monastic community in Taizé, France, partly in response to the growing crowds of thousands of young people, from diverse countries and denominations, visiting each year. Given the common prayer's simplicity, it lends itself easily to participation by all present, across differences of language, denomination or culture. In particular, the Brothers of the Taizé Community have found such meditative singing practices particularly effective in supporting young people to become truly open to an inner dialogue in prayer. For more information visit Taize Houston's Facebook page. Contemplative Network (CN) is proposing groundbreaking neuroscience brain scan research comparing the memories of near-death experiences (NDE) with the memories of spiritual contemplative experiences (SCE). These states share common attributes at the cusp of transcendence between this world and the next; some people have even experienced reliving NDE as SCE. Some of the best scientists in the world have enthusiastically joined the research team. The lead is Calixto Machado M.D., Ph.D., one of the world’s experts on recovering people from unconscious states with scans of NDE patients. Fr. Gilbert Walker, formerly board member of Contemplative Outreach Ltd., has knowledge of subjects who have had SCE. A more detailed summary of the proposed research appears below. Please contact me if you have any questions. We respectfully request your and, if applicable, your organization's help in making donations for this unique study. Our goal is $200,000. In accordance with the following, donations may be made to Contemplative Network, a US non-profit, tax-exempt organization. Compare the neural correlates of the memories of Near-Death Experiences (NDE) and Spiritual Contemplative Experiences (SCE). Over the centuries saints and prophets from all faith traditions have reported SCE and NDE, with both these altered states of consciousness having similar attributes. Depending upon religious beliefs both are at the cusp of the transcendence to the next life, which has never been comparatively studied in this way by neuroscience. Medicine has debated the bioethics of defining the moment of death. People have reported an occasional reliving of NDE during prayer as SCE. Neuroscientists are interested in the neural correlates of the pathological and physiological generation of consciousness. It is hoped that this research will shed some light on these important subjects. CALIXTO MACHADO, M.D., PH.D. FAAN, a neuroscientist, is one of the world’s experts on patients recovering from various unconscious states. He is Corresponding Fellow of the American Academy of Neurology, President of the International Symposia on Brain Death and Disorders of Consciousness, and President of the Cuban Society of Clinical Neurophysiology Institute of Neurology and Neurosurgery. HAROLD G. KOENIG, M.D., a psychiatrist, is one of the world’s experts on the subject he edited in the seminal book “Handbook of Religion and Health.” He is director of Duke University’s Center for the Study of Religion/Spirituality and Health. He’s published over 450 scientific articles in peer-reviewed journals, and more than 50 books in print or preparation, on spirituality and health. ANDREW B. NEWBERG, M.D. a neuroscientist, is a prominent researcher in nuclear medical brain imaging and neurotheology, having authored many books, the latest entitled “Neurotheology”. He is the Director of Research at the Myrna Brind Center for Integrative Medicine at Thomas Jefferson University Hospital, an Adjunct Professor of Religious Studies and an Associate Professor at the University of Pennsylvania School of Medicine. RAMIRO SALAS, PH.D., a neuroscientist, is in the field of brain imaging, neuropharmacology, and reward/disappointment brain processing. He is Associate Professor, Psychiatry Research at Baylor College of Medicine (BCM). He has numerous publications, most recently on the effects of discursive prayer on the brain and it’s lessening of the symptoms of depression. YANIN MACHADO, M.D., a neurologist, is co-organizer of the International Symposia on Brain Death and Disorders of Consciousness. She has completed research on autism, Alzheimer’s disease, heart rate variability, and other topics. MAURICIO CHINCHILLA, M.D., a neurologist, is a principal researcher in the field. He is on Dr. Machado’s team and has participated in many studies and co-authored many papers with him. ROBERT J. HESSE, PH.D., a physical chemist and Catholic deacon, is in the field of the convergence of faith and science. He is President and Co-Founder of Contemplative Network and Adjunct Professor at the Institute of Spirituality & Health (ISH) and at the University of St. Thomas (UST). He has taught Centering Prayer (CP) to hundreds and lectures worldwide. Dr. Machado has available existing electroencephalogram (EEG), magnetic resonance imaging (MRI), and computerized tomography (CT) scans on over 100 patients who recovered from various unconscious states. From those and new patients at numerous emergency rooms, he will identify 18 subjects in Cuba who report having had NDE. Dr. Hesse will identify 18 subjects that are long-term CP practitioners from the contemplative community in Cuba who reported having had SCE. Fr. Gilbert Walker, a Catholic priest in Cuba who teaches CP, will assist him. GREYSON SCALE - All subjects all will be given a Greyson Scale (GS) to describe their experiences, either NDE or SCE, which often share the following attributes: cognitive e.g. timelessness, affective e.g. peacefulness, paranormal e.g. out-of-body, and transcendental e.g. divinity, along with a measure of religiosity. NEUROLOGICAL EVALUATION - Full neurological evaluations including, conventional CT and MRI scans, will be given to screen that they do not presently have brain injuries. There will be two separate groups, those who report having had NDE and those who report having had SCE. The procedure will have the following steps. RESTING STATE - Quantitative EEG (QEEG) and functional MRI (fMRI) scans will beperformed on all subjects, which will become the resting state baseline control. REMEMBERING STATE - QEEG and fMRI scans will be performed on all subjects while they are being asked to remember their experience, either NDE or SCE. Though this is a study of memories of events and not the events themselves, the resting state functional connectivity is expected to show how the brain changes because of the experience. A research protocol with more detail including references can be made available. The Ethical and Scientific Committees in Cuba have already approved the protocol according to the Helsinki Guidelines. An Institutional Review Board (IRB) application is not required in Cuba but it will be applied for as needed by the US researchers. This study is expected to take about 11 months, 7 months for research and 4 months for the final published report. It is hoped that preliminary results may be reported at the Pontifical Academy of Sciences meeting in September 2018 in Houston. And that the final results may be reported in December 2018 at the internationally attended VIII International Symposium on Brain Death and Disorders of Consciousness in Cuba. Cost is estimated at $200,000 of which $180,000 will be under lump sum contract (LSC) for work in Cuba and $20,000 under reimbursable contract (REC) for work in the US. The LSC will be done legally in accordance with the regulations of the Department of the Treasury's Office of Foreign Assets Control (OFAC) and Cuban Assets Control Regulations (CACR). The LSC will make progress payments based on research deliverables: $18,000 (10%) as an advance payment, $5,000 per subject based on completed scans and evaluations, then $9,000 (5%) payment upon publication of the final report. A factored cost estimate with more detail can be made available. Donation(s) are solicited through the United States non-profit 501 (c) (3) tax-exempt organization Contemplative Network with IRS tax I.D. number 27-1738129. In 1999, Andrew Newberg, M.D. studied a group of Franciscan nuns who had been practicing Centering Prayer. It was the first brain scan of Christian contemplative practitioners. He discovered that there were significant neurological changes that differed from normal human brain functions. The frontal lobes, known to be the seat of moral judgment and spirituality, had increased activity; the limbic activity decreased; and the combination generated a peaceful and serene state of consciousness. Since that early work, there has been considerable research on the subject, much of which has been on non-theistic Tibetan Buddhist monks, yet comparatively little on theistic Christian practitioners. As valuable as that research has been, it misses the opportunity available from the findings of research on the power of faith, which over 90% of the U.S. population has. Though most researchers are Christian, they have difficulties getting enough practitioners, since the focus has been mostly on a small number of Tibetan monks; whereas, there is a much broader base of theistic interfaith practitioners with over 100,000 Christian contemplatives alone. Research incurs a high cost of transporting equipment and researchers to the practitioners, rather than capitalizing on these local practitioners. There seems to be a greater emphasis on theoretical neuroscience, as opposed to clinical applications. The research is fragmented worldwide, rather than having a physical focal point, as could be the case in the Houston Texas Medical Center (TMC), which is the largest in the world, exceeding the next largest by four times. Please click here to learn more about Proposed Collaboration. Houston – (March 26, 2013) – Baylor College of Medicine (BCM) and the Institute for Spirituality and Health (ISH) have teamed up to study the effects of spirituality on the brain. This new collaboration, signed by Dr. Dora Angelaki, chair of neuroscience at BCM, and Dr. John Graham, president of ISH, is a Master Research Services Agreement between the two institutions that includes the use of the Center for Advanced MR Imaging, one of the worlds’ largest, at BCM. Researchers through the ISH, located in the Texas Medical Center, the world’s largest medical complex, will not only use the functional magnetic resonance imaging facilities (fMRI) at BCM but also collaborate with researchers within the department of neuroscience. The first such project is currently in the planning stages for later this year. The goal of the ISH, at 57 years the oldest such interfaith organization in the United States, is to engage in scientific research to provide evidence-based information on the role spirituality plays in health and healing, as well as educate and equip healthcare professionals so they may incorporate spirituality in treatments of patients when needed. This collaboration was also completed with the support of BCM’s Center for Advanced MRI (CAMRI) Director of Research, Krista Runge, and ISH Vice Chairman, Dr. Robert Hesse. Resource Meetings introduce and refresh contemplatives from beginning to end. They often begin with talks or videos by renowned contemplatives, and offer discussion, time to share hints and tips, as well as encouragement. Centering Prayer Contemplative Retreats are held in different retreat houses in the area and last from a weekend to 10+ days. They consist of 3-4 hours of group Centering Prayer sessions with 20-30 minute sits at a time. Each retreat consists of either grand silence, i.e. no talking or eye contact, or no talking except after dinner with spiritual readings during meals. The retreats are led by experienced commissioned presenters from Contemplative Network. Ruah Center will offer a Centering Prayer Intensive Retreat, a deepening experience designed for those who already have a well-established daily contemplative prayer practice, on June 20-26. For those who cannot get away for that long, Ruah welcomes you to join them from June 23-26 for a mini-retreat. To register call 713-928-9962 or email ruah@ccvi-vdm.org. Centering Prayer is for anyone serious about becoming freer to realize and fulfill the call summed up on these words: "Love the Lord your God with all your heart, all your soul, all your strength, and all your mind, and love your neighbor as yourself." (Matthew 22:37) Centering Prayer is a very simple way of prayer which can be used by anyone who wants to be with God, and experience God's love and presence. See the list of Upcoming Weekend Retreats in the Houston area. Many of us have observed the wonder and the presence of God in a beautiful sunset. In this series of presentations, we observe the wonder and presence of God in the cosmos. Bob Hesse, Ph.D. addresses the recent, fascinating convergence of science and religion by describing in laymen’s terms, from the scientists’ standpoint, their excitement of discovery. Then participants are encouraged to draw analogies to the beauties of religious faith. This is a presentation in four parts: physics to metaphysics, chemistry to life, biology to consciousness and psychology to mysticism. It takes about 3-4 hours and can be presented 3-4 sessions or all at once with breaks. An outline of the topics covered can be viewed below. Click here to view Science and Mysticism video. Click here to review the Convergence of Science and Religion Outline - 2010. If you are interested in receiving communication from Contemplative Network, please submit the following information. All communication sent to us is considered private and will not be shared with any other company or individual. Yes, I would like to receive email from Contemplative Network. Yes, I would like to receive a Schedule of Events. * Introduction to Centering Prayer Workshop offered in Spanish on Saturday 9:30-3:00. ** Introduction to Centering Prayer Workshop offered in English on Saturday 9:30-3:00. Registration online begins 7 January 2019. Please register by 20 April 2019. Dr. Robert Hesse frequently gives presentations on Centering Prayer, introducing its practice and practical results. The Catholic University of America is recruiting experienced meditators to complete a set of online questionnaires related to your thoughts and feelings. Please do NOT participate in this study if you have already done so in the past. The Catholic University of America's IRB has approved this research. Participation in this study is anonymous and voluntary, and there is no penalty if you do not finish all of the measures. Completing the survey should take about 15 minutes. The questionnaires include items asking about your thoughts and feelings, along with background information such as gender, age, ethnicity, education level, and meditation experience. Please visit this website to complete the questionnaire. If you know any other experienced meditators who might be interested in participating please feel free to forward to them. If you have any questions about this study, please contact Carol Glass at glass@cua.edu. Carol R. Glass, Ph.D. and Diane B. Arnkoff, Ph.D.
You are invited to a special retreat with Fr. Cyprian Consiglio, a Camaldolese Benedictine monk with a keen interest in meditation and prayer. He is a recognized scholar of the writings of Bede Griffiths and Abhishiktananda. His journey of contemplation and outreach has taken him around the world and it is reflected in his deeply moving music. Join us for what is sure to be a retreat of inspiration and beauty! For further inquiries call Sharon Nicks at 520-829-3197 or email at sharon@wccm-usa.org. Roots of Christian Mysticism Series, 9 a.m. to 12 p.m. fornine Saturday mornings through May, begins September 13 with “17th Century French Mystics ” presented by Rev. Charles J.T. Talar, Ph.D., S.T.D., Professor of Systematic Theology at the University of St. Thomas School of Theology at St. Mary’s Seminary. French Mystics such as St. Francis de Sales and St. Jeanne de Chantal focused on Jesus as the Incarnate Word of God. Fr. Talar will explore how a deeper understanding of the their emphasis on a personal experience of the person of Jesus can enrich both our devotional and spiritual lives. The session will also include discussion and meditation. Dominican Spirituality Center, 6501 Almeda, Houston. Full series tuition $225 ($199 if registered before September 13 or $25 per class at the door.) Need based scholarships available. To register online go to: www.wccm-usa.org/upcoming-events/ For more information contact Martha Keesecker 713 464 0818 or marthakeesecker@comcast.net. Presented by The World Community for Christian Meditation www.w.ccm-usa.org. Can a person be a Zen Christian? Dr. Hesse and VM Miao Tsan will give a presentation on interfaith dialogue and discuss possible collaboration and integration of Zen and Christian practices. Lunch provided, RSVP at events@miaotsan.com or call 281-589-0810 ext. 8921. 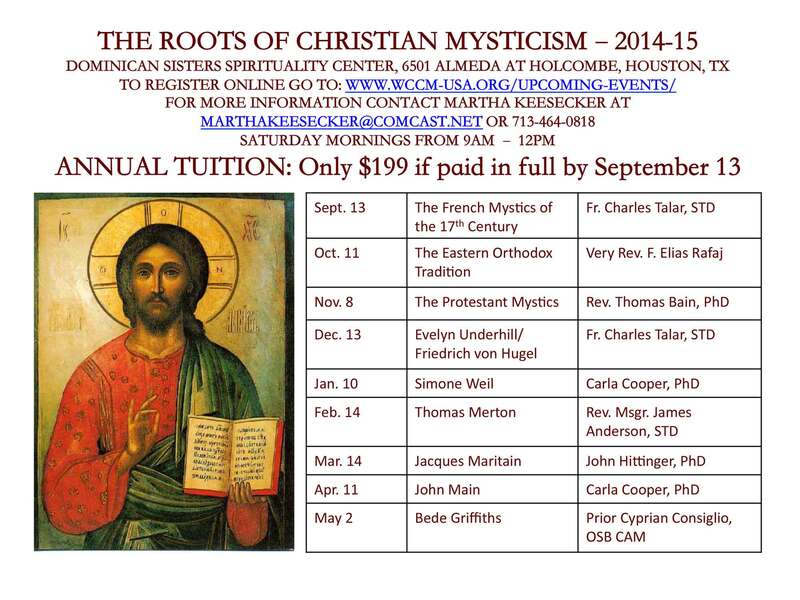 This three-year course offers a unique opportunity to explore, in depth, the history of Christian Mysticism. It is structured and taught by leading scholars and practitioners and focuses on the key figures of the mystical tradition. The syllabus will begin with the Old and New Testament roots of this tradition to the great patristic teachers and then through the Desert Fathers, Meister Eckhart, the English Mystics, the French Mystics, the Protestant Mystics and to modern times with a focus on Evelyn Underhill, Friedrich von Hugel, Simone Weil, Jacques Maritain, John Main and Ede Griffiths. The second year of our series begins with Hildegard of Bingen on September 14, 2013 presented by Ann Gebuhr, PhD. You need not have participated in the first year to enjoy/benefit from the remainder of the series. Anyone of any spiritual tradition (or none) who wishes to explore Christian Mysticism in depth is welcome to take this course. Tuition is $225 per year and is due each year on or before the morning of the first class. Dr. Bob Hesse and others will be giving a presentation on exercising emotional well-being and exploring resources available to relieve stress and anxiety. Spiritual leaders, nurses (RNs/LVNs), therapists, community health workers, social workers, chaplains, health ministry teams, and the general public are all welcome to attend. Free registration, $25 fee for supplies and lunch. Free contact hour certificates for chaplains, occupational therapists, community health workers, others. Additional $10 fee for CEUs for nurses, LMFTs, psychologists, & social workers. Limited to 125 people. Click here for a program of the days events. FREE PARKING available, click link provided. Floor plan for activities once you arrive. Join Dr. James Finley, renowned retreat leader, Merton scholar, and master of the Contemplative Way on a spiritual retreat to find your path on the contemplative way. James Finley leads retreats and workshops throughout the United States and Canada, attracting men and women from all religious traditions who seek to live a contemplative way of life in the midst of today's busy world. He is also a clinical psychologist in private practice with his wife in Santa Monica, California. His books include: Merton’s Palace of Nowhere, The Contemplative Heart. Click here for a retreat schedule. Click here for retreat topics. Advanced degrees are being granted in neurotheology yet there is some debate on the field being substantive. The subject is being driven by the fact that scientists are starting to recognize that near-death and contemplative experiences are both real and similar, and potentially related to neuroscience. Even today there are reports of experiences similar to those described by Sts. & Drs. Teresa of Avila and John of the Cross. This presentation will explore the nature of these phenomena by starting with historical background then discussing the biological brain’s dualities and conflicts including both conscious and unconscious. Comparisons will be drawn between the neurology of both near-death and mystical experiences. Because prayer can lead to contemplative experiences and because of the principle of non-dualism, i.e. that the body and soul are interstitially meant for each other, research will be proposed for studying the effects of cataphatic and apophatic prayer on the brain. A frontier of science is the study of consciousness. Some think it is in the brain and some elsewhere. Yet it, together with conscience, determines our ability to make valid moral judgments. The informed conscience includes the biological, informational, and spiritual yet often the biological is overlooked in moral theology. This discussion will include all three and make the case that our loose use of the term “sin” must be tempered especially in light of biological case studies on conscience and consciousness, as they relate to church teaching on the “informed conscience.” One obstacle to an “informed conscience” is “confirmation bias.” Prayer, particularly contemplative prayer, will be discussed as a way to overcome that tendency. As Pope Francis said in his recent interview: “Human self-understanding changes with time and so also human consciousness deepens.” This will lead to a discussion on a better understanding of how the informed conscience can affect bioethical decisions. CONFERENCE THEME: Responding to the limits and possibilities of the body. 1. THE INSTITUTE FOR SPIRITUALITY AND HEALTH (ISH) (www.spiritualityandhealth.org), at 59 years the oldest such organization in the country. It is located in the Texas Medical Center (TMC), which is the largest medical complex in the world. 2. CONTEMPLATIVE NETWORK (CN) (www.contemplative.net), an interdenominational Christian contemplative prayer network that teaches Centering Prayer (CP) and promotes interfaith dialogue and scientific research. and health, with special attention to issues of embodiment in contemplative prayer. COHESIVE ABSTRACT: A unique capability of the human body is consciousness and its ability to focus the mind. Capitalizing on this every major religion has a contemplative prayer tradition for example among the Abrahamic faiths there is Kabbalah for Judaism, Mysticism for Christianity, and Sufism for Islam. The generic secular term is meditation, which can take two forms, engagement of the imagination and concentrative focus on a mantra. Practitioners know that contemplative prayer can bring a sense of peace and oneness, which is consistent with the embodied Abrahamic traditions’ worldview that the body and soul are interstitial i.e. non-dual or holistic. Research has shown that secular meditation and separately that theistic belief both promote embodied healing. Studies on combining those results into a theistic contemplative prayer practice have shown that, regardless of the faith belief, contemplative prayer can promote physical, psychological, and spiritual healing. The panel consists of Jewish, Christian, and Islamic prayer practitioners with training variously in medicine, science, and religion, who will give their personal experiences plus teaching and research observations of embodied healing. shape our health, and directs us to a deeper understanding of how to employ seemingly disparate healing concepts in a cohesive and holistic way. Descriptions of the manifestations of each of the four worlds on the level of the body will be given, as well as the factors that create disturbances in each world, appropriate interventions, and their effects. Examples will be presented of interventions on one world creating healing on another. Presenter: Rabbi Cindy Enger M.A.H.L., J.D. 3. ISLAM: Sufism takes its roots from holy book of Islam; Qur’an and practice of Muhammad (pbuh). Sufism is inner, mystical dimension of Islam. A practitioner of this tradition is generally known as a ṣūfī ( ﻲﻓﻮﺻ). This presentation will present the concepts, themes, history, practice and embodied healing effects of Sufi contemplative prayer. The greatest goal for a Sufi is to understand the relation between Allah, human, and existence and his position before God. Major themes of Sufism will be discussed including Imani billah, belief in God’s oneness, Marifetullah, knowledge of God, and Muhabbetullah, love of God. Sufis practice many unique ways to deal with illnesses based on prophet Muhammad’s advise that prayer and medicine be used side-by-side. Embodied healing of different sicknesses will be discussed based on Sufis using different names of God. One of the names of God is “Shafi, Healer”. Repeating those names in certain numbers resembles the teeth on a key which keys, function successfully only with their certain shapes. Ruah Center's gathering will begin with a centering prayer session followed by a DVD talk by James Finley (25-30 minutes) from a series called Following the Mystics through the Narrow Gate, a DVD series that explains the experiences of mystics through history, followed by centering prayer. Begins at 7:00 in the evening and will not go later than 8:00. RSVP with Janet Troy at 713-928-6053 or jtroy@CCVI-VDM.org beforehand. Hosted at the Whitley Theological Center at the Oblate School of Theology in San Antonio, this presentation Monday through Wednesday will present contemplations into the teachings of Thomas Merton, St. Theresa of Avalon, and St. John of the Cross, as well as how to overcome obstacles that hinder you from a quiet contemplative practice in a busy lifestyle. Carl McColman has written twelve books on a variety of spiritual topics. His works include The Big Book of Christian Mysticism, The Lion, the Mouse and the Dawn Treader, 366 Celt: A Year and a Day of Celtic Wisdom and Lore, Spirituality: A Postmodern and Interfaith Approach to Cultivating a Relationship with God, and The Aspiring Mystic. He created his first website, the “Website of Unknowing” as he called it, in 1996 and has been blogging since 2003. His writing has also appeared at the Huffington Post, Beliefnet, Patheos, as well as in print publications like PanGaia and Evolve. Carl is a sought-after speaker, teacher, and retreat leader on topics such as Christian mysticism, the contemplative life, monasticism, writing as a sacred practice, Celtic wisdom, and interfaith spirituality. A new course on Faith & Science will be offered covering physics to metaphysics, chemistry to life, biology to consciousness, and psychology to mysticism (ref. attached syllabus). It will be held at the University of St. Thomas in the Spring semester of 2013. It will be taught jointly by Dr. Donald Frohlich and Dr. Robert Hesse with nationally distinguished guest scholars Rev. John Graham M.D., D.Min. speaking on the subject of medicine & healing, and Ken Pargament Ph.D., speaking on the subject of psychotherapy & spirituality. For more information contact Dr. Adam Martinez at 713-942-5067 and martinag@stthom.edu or to audit the course visit the link here at the registrar’s office. Please join the Institute for Spirituality and Health (ISH) on May 14th for an evening of learning and practice from both eastern and western traditions. Three long-time contemplatives will share their wisdom and insight with us, namely Lex Gillan, Dr. Anne Klein, and Dr. Bob Hesse. Cost is $25 and includes dinner. Space is limited, RSVP by May 12th. To register contact 713-797-0600 or visit the Institute for Spirituality and Health website. Brochure can be found here (PDF). Father William explores contemplative prayer as presented in the 14th century book, The Cloud of Unknowing. His study, practice and teaching of this form of meditation has transformed and deepened his own spiritual ties. Join Father William on a journey to a more intimate relationship with God. On Holy Saturday, in anticipation of Easter Day, we take time out to reflect and remember the women - those who followed Jesus to Jerusalem and stood beside him at the cross and burial. This innovative musical performance and meditation imagines the thoughts and prayers of Mary the Mother, the woman at the well, the woman with nard, Mary of Bethany, and Mary Magdalene, as they remember their times withJesus and endure the sorrow of the cross. Join us for this original script and meditative hour of music. Original script by April D. DeConick and Betty C. Adam, music composed and performed by Becky Baxter and Sonja Bruzauskas. In this retreat, Father Laurence Freeman, OSB will show how our mystical tradition is being recovered today on a scale never imagined before. Through meditation in daily life, the experience of the masters of the past can transform our own personal lives and that of society globally. More than anything else today, the world needs people who know this in their own experience. Fr. Laurence will teach, dialogue and share common meditation sessions to lead us to a deeper understanding of this movement of hope in our time. For more information, go to wccm-usa.org or contact Pat King (713 444-6014 patrickking50@gmail.com). Presented by the World Community for Christian Meditation. “’Where are you?’ is indeed, a question of great magnitude. Are you still at the age of one or two, where your emotional program for security is the chief energy that determines your decisions and relationships, especially the relationship between God and you? Are you so enamored with your religion that you have a naïve loyalty that cannot see the real faults that are present in a particular faith community? Do you sweep under the rug embarrassing situations and bow to the security or esteem needs of the community? Paul Illecki, a former priest and monk at St. benedict's Monastery in Snowmass, CO, holds a doctorate in adult learning and development. He was assistant dean of the Graduate School at UNC-Chapel Hill. He currently serves on staff of Intensive Centering Prayer retreats for Contemplative Outreach of Colorado, conducts his own meditation retreats and workshops, and teaches reflective journaling using the Intensive Journal® developed by Dr. Ira Progoff for Dialogue House, NYC. He developed Just Noticing (a journaling technique) in response to a felt need for a noticing process that more directly complements contemplative practices. He is a musician, holding both bachelors and masters degrees, and performs as an expression of his own contemplative passage. He is a copy writer for health, wellness and motivational publications. His hobbies include weaving and spinning. Paul loves to cook. He lives in Buena Vista, Colorado. Join us for the second Cynthia and Judd Oualline Series in Spirituality at Chapelwood United Methodist Church as Paull Illecki speaks about how to maintain an innner experience of God in a world of action. Note: attendance is free but requires you to register. Email Nancy Sterling at nsterling@chapelwood.org no later than November 21st. Join us for another talk on the Illusion of Progress in the Spiritual life. Registration for this talk is optional but requested. See above for Nancy Sterling's contact information for registration. MISSION: As a spiritual network, Contemplative Network shares the method of Centering Prayer and its immediate conceptual background, and includes Christian interdenominational, interfaith collaboration, and scientific research. This will be a Catholic perspective on the principles of how we make moral decisions and then how we apply those principles to specific faith issues relevant to the upcoming presidential election. Dr. Pargament will highlight research, which demonstrates why it is so important to move to a truly holistic approach to health care. He will introduce the presentation by talking about some of the reasons for the historical tension between the worlds of spirituality and healthcare. He will then present an empirically-based rationale for spiritually integrated health care: (1) spirituality is a vital resource to people dealing with illness; (2) spirituality has been linked to better health outcomes; (3) some forms of spirituality have been tied to declines in health and well-being; (3) patients prefer a more spiritually integrated health care, and; (4) spiritually integrated care has proven to be effective. The key question then discussed isn't why should we integrate spirituality into health care, but what's taking us so long? Your are invited to attend a free presentation by one of the world's top experts in the field of spirituality and health, Dr. Ken Pargament. Take the spiritual journey of a lifetime for an unforgettable experience of Christian contemplation. A 14-day journey to Avila, Spain with Carmelite Rev. Stephen Payne, OCD for teachings on the contemplative experiences of Santa Teresa and St. John of the Cross. Signup deadline is March 1st. At the age of 18, James entered the Trappist Monastery of the Abbey of Our Lady of Gethsemani in Kentucky. During this time his novice master was Thomas Merton. He spent six years at the monastery living the traditional Trappist life of prayer, silence and solitude under Merton’s guidance. Through his profound teachings, James allows us to chuckle at our human frailties and accept them as God’s creation as we move through opening our hearts to a larger reality. At this conference, an emphasis will be given to the teachings of the mystics that help us pass through the challenges and graces in which we are awakened to God’s presence in our lives. • Other fundamentals of Contemplative Living will be introduced. • Time will be given for group meditation, personal reflection and discussion of the themes presented. Registration for the conference closes May 31st and if you wish to stay at the hotel reservations must be made by May 23rd. For their web page, please click here. For brochure and registration forms, please click here (PDF). Also, click here for a glowing review of the recent James Finley DVD, Following the Mystics through the Narrow Gate. On behalf of Master of Arts in Faith and Culture student Jun Orteza, we would like to invite you to a lecture-workshop entitled “Conscience and Consciousness” to be held on Saturday, April 14th. The lecture-workshop, featuring speaker Robert J. Hesse, Ph.D., will explore the self-awareness, faith and reason necessary to render moral judgment. As seating is limited please RSVP at onoevans@gmail.com with the number of people in your party and what church you attend (optional). On the day of the event, please park in the front of the church and use the front entrance. Thanks. Fr. Robert E. Kennedy, SJ teaches Theology and Japanese at St. Peter’s College, Jersey City. He is a practicing psychotherapist and the author of Zen Gifts to Christians and Zen Spirit, Christian Spirit. He is active in interfaith work, teaching zen to persons of all faiths. He studied Zen in Japan with the Japanese master Yamada Roshi. Later he continued his study under Maezumi Roshi in Los Angeles and Bernard Tetsugen Glassman Roshi in New York; in 1991 was made Sensei (teacher) and in 1997 was given the title Roshi or Master. He holds doctorates in Theology from the University of Ottawa and from St. Paul University in Ottawa, a Masters in Theology from Sophia University in Tokyo, a Doctor of Ministry in Psychology and Clinical Studies from Andover-Newton in Boston. This is a silent meditation retreat with formal instruction and teaching. The retreat begins with dinner at 5:30 pm on Thursday and ends at 11:30 am on Sunday morning. Registration begins at 4:00 pm on Thursday. VISION: Most faiths have contemplative traditions and we look to a future of interfaith contemplative prayer practice that recognizes the spiritual importance of silent prayer in healing both the body and soul. MISSION: As a spiritual network we share the Christian interdenominational method of Centering Prayer and its immediate conceptual background. We also promote scientific research and interfaith dialogue and collaboration on contemplative prayer. Contemplative Network has found the following links to be Significant Sites for its programs. Feel free to explore the information below! Thomas Keating - Contemplative Outreach, Ltd. Cell of Peace - The Contemplative Outreach of Dallas/Fort Worth. Special annual events with teachers like Fr. Bill Sheehan, Fr. William Meninger, and others. The Boniuk Foundation - Yan Digilov of the Boniuk Foundation interviews three people on approaches to prayer which are less typical or well-known. The first segment is with Carole Pentony on Centering Prayer. Yan employs insightful observations and questions to weave all three perspectives together. Hacker Nun - The lovely Sr. Deidre Jordy, who owned and offered us our web address of contemplative.net ! The following individuals are available to give the Introductory Workshop in Centering Prayer. Long-time facilitator of the weekly Centering Prayer group at St. John the Divine Episcopal Church. Trained facilitator of Centering Prayer workshops and follow-up groups. We may think of prayer as thoughts or feelings expressed in words. But this is only one expression.In the Christian tradition Contemplative Prayer is considered to be the pure gift of God. It is the opening of mind and heart — our whole being — to God, the Ultimate Mystery, beyond thoughts, words, and emotions. Through grace we open our awareness to God whom we know by faith is within us, closer than breathing, closer than thinking, closer than choosing – closer than consciousness itself.